Alayne bravely stepped behind the manure spreader last Friday with the camera to get this interesting view as I was spreading — you can see the pieces come flying out, but she was at a safe distance so not to worry! Yes, it’s the season to clean out the barn and corral and spread the winter’s worth of manure and bedding pack on the hayfields. The trick is to wait long enough for the ground to dry out but not so long that the grass hasn’t already come up tall enough that you?risk’smothering it. So it all depends on the weather — waiting for?a sufficient dry spell to come along. 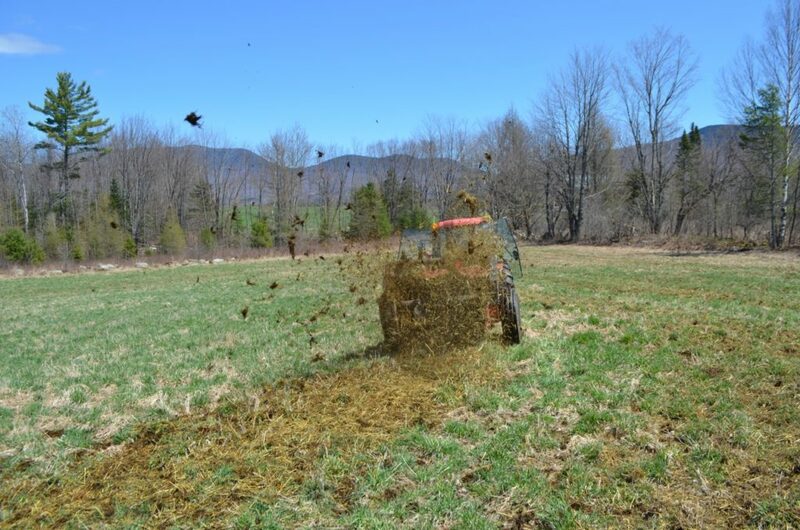 This is how we fertilize the hayfield — naturally. Much of the bedding pack was wasted hay from the goat barn. Goats are, contrary to myth, very fussy eaters, and will sift through a lot of hay to find just the “right” piece to eat, and discard everything else. Goats eat a wide variety of forage, but they are picky, and the result is quite a bit of hay gets pulled out of the feeders and dropped on the ground. This is actually okay, because that wasted hay then becomes their bedding, giving them a warm, dry place to rest, and it soaks up their manure and pee. 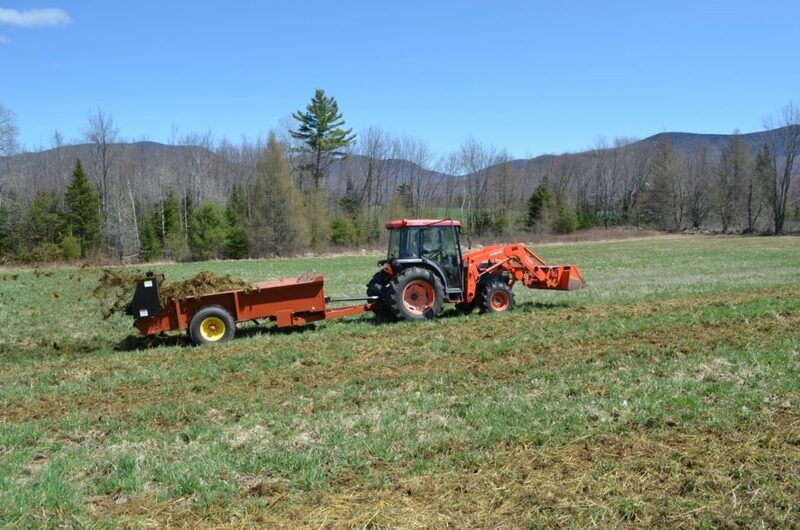 By spring, it’s a deep bedding pack loaded with fertility (the manure) and organic matter (the hay), which then becomes perfect fertilizer to enrich the fields that grew the hay in the first place. A nice, closed (dare I say: “sustainable”?) fertility cycle. The only amendment we occasionally add is wood ash for minerals. There’s no shortage of manure-spreading in an election year, but this is the only kind worth taking photos. Philippa is right on that!! (The election manure-spreading!) Great shots! I can’t top Philippa’s comment! I admire your sustainable farming from a safe distance. Alayne is very brave. Mucking-out time on my grandfather’s farm was no one’s favorite time of year, but it is a necessary part of farming. Thank you for the latest newsletter, wonderful as usual. I particularly enjoyed the feature on Sunny. I often thought of a manure spreader, but with just two horses, the cost was not justified. Fast forward 10 years, now that the horses have gone to that great pasture of eternity, that manure has evolved into the best dirt! We dug down a little to fill two giant (12 X 4) raised garden beds last year, and had the best vegetable harvest ever. Not sure our proud horses would have wanted their legacy to be plump snap peas and giant bell peppers,but we thank them for their contributions with every salad!! Philippa—ha ha ha!! Great Farmers but even BETTER animals rescuers.